The inspiration for this web site is what Americans did to win World War II. There has been much written about the generation that sacrificed so much and about the brave men and women who went overseas in life-threatening circumstances to protect the world from fascism. This web site is more about what was done here in the U.S. to win the war. In a very short period of time, Americans came together to build the hardware the fighting forces needed…. a quarter of a million airplanes, hundreds, perhaps thousands, of ships from small landing craft to great battleships. To use the vernacular, what Americans did in those few short years, simply blows me away. And of course it didn’t start with World War II. It goes back many generations of Americans doing the hard work to build a great country. I want to be clear; there are tidbits of history on this site, but I am not an historian. I see myself as a sort of cheerleader. I want to draw attention to America’s great ships and naval history in hopes that visitors to this site will want to learn more. There are many good sources of information on any topic you want to pursue. No matter how many hours I put into researching the ships and building this site, it will never do more than scratch the surface of this amazing subject. 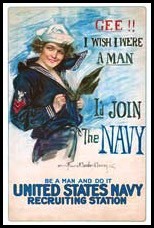 At the beginning of the 20th Century, full-color printing was coming of age, and the U.S. Government produced posters that would promote patriotism and encourage people to enlist in the Army or Navy or support the war effort on the home front. The best illustration artists of the day were patriots and donated their talents for the cause. We offer a collection of the most colorful and wonderful patriotic illustration art in American history with beautifully reproduced poster art prints - just $12.95 with free shipping. Even if you don't purchase, the web site is an-up close look at this fascinating subject. This site is a work in progress. There is so much not yet covered such as PT Boats, Landing Craft, Transport and Support Ships and so on. 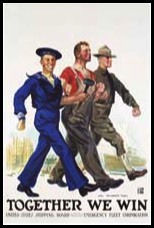 The U.S. won World War Two, but it was never assumed that we would, and history might well have taken a very different turn if it were not for every single destroyer, submarine, and PT Boat; if it were not for every self-sacrificing sailor and marine… if it were not for every single American who worked overtime to build the ships, planes, and tanks that were needed. Every time I learn something new about those years, I am simply in awe of what Americans did. Tribute is not a strong enough word. Listing of modern U.S. Navy ships preserved as museums. Listed by category with links. Photos and descriptions of Navy ships in the era of steam through the First World War. Starting with the American Civil War, how the submarine evolved as an effective naval weapon. Photos and descriptions of submarines that helped to win the war. Starting with DD-1 in 1902, see how destroyers evolved into the fighting machines of the 1930’s. Development of the destroyer leading up to World War Two. The Fletcher, Sumner And Gearing classes built during the war. Photos and descriptions of post dreadnought battleship classes that fought in the war. Photos and descriptions of the cruiser classes that served in the war. Background of the ship that Roosevelt designated as a Memorial. This page will be a place where veterans can tell their stories. 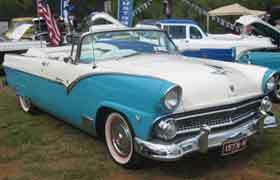 How well do you know your Great American Cars? 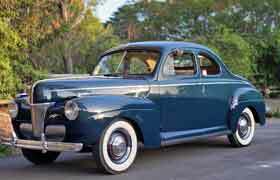 ––––Click on the 1943 Ford. Photo by Corpmods, licensed under the Creative Commons Attribution. Photo by GTHO, licensed under Creative Commons Attribution 2.0 Generic. 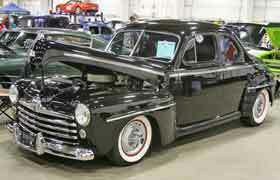 Ford Motor Co. built 8,000 of these in the mid 1940’s in their Willow Run plant. The whole country had gone to work supporting the War effort. The car companies were all building military hardware during the war — not cars. 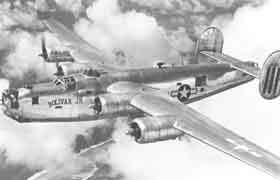 The 1943 Ford was a B-24 bomber. Note that the only real design change since the earlier models was the grill. Photo by Dave 7 from Lethbridge, Canada. licensed under Creative Commons Attribution 2.0 Generic. This site is part of the American Tribute Online project. It is not a commercial site, and it is not associated with any museum or other organization. The purpose of the project is to celebrate our American heritage and provide an online resource for showcasing the America that we can all be proud of.